At the end of the line was Widen. The Rich Run Mine located here was the pretty much the whole reason for the BC&G. Countless tons of coal were moved from Widen to the interchange with the B&O at Dundon in the years before the mine closed in 1963. 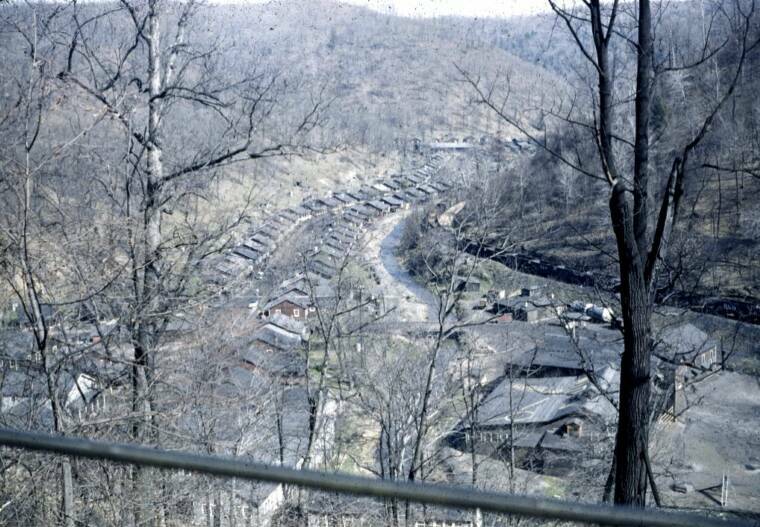 Widen was a classic Appalachian mining town. The tipple and it's associated buildings dominated the landscape and it and everything was covered with coal dust. All the buildings were there, however, to make it a town that could fully support the residents of which there were 1274 in 1925. 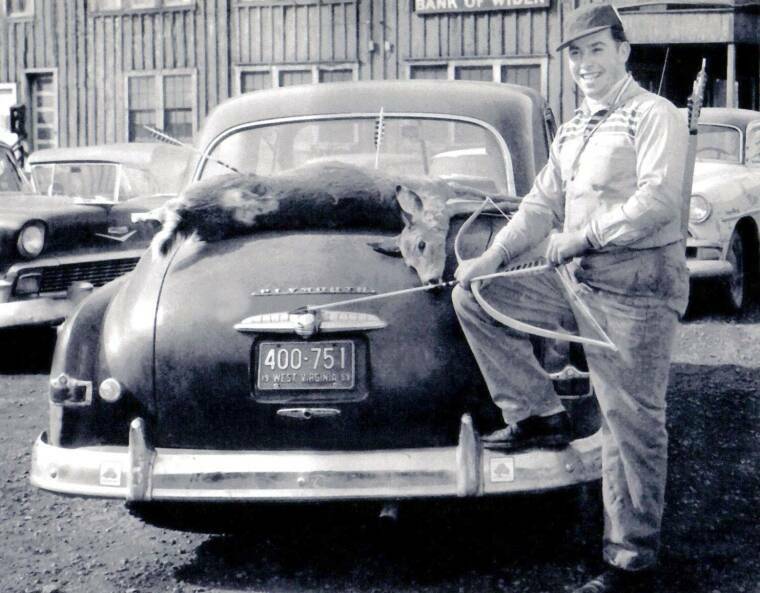 That number had dwindled to 600 by 1960. There were houses for the employees, a bank, a big company store, schools, churches, a YMCA and many other structures. All of the buildings were owned by the ERC&L Company. Selecting images of WIden to include on this site proved a little problamatic. The mine structures and the associated track arrangements were continuously being modified. I've tried to show images of the tipple at several points over time. Below is a general plan for Widen as it appeared in the 1950's surmised from the various photos. "The seven houses on the left side in the picture were three rooms, "L" shaped dwellings, with the exception of the first one, remodeled and used as a doctor's office, and drug store complex. The house next to it used the two front rooms for a coal testing laboratory..."
Click on the image to see an enlarged version. Note the outhouses (3) sitting on the bank of creek. According to WIDEN, an Appalachian Empire, while the mine and the managers and superintendents had running water in their homes in the late 1920's, all of the miner's houses didn't get it until the early 1950's! Telephones were not installed in Widen until 1959. This is what is was all about...COAL! Notice the three different grades visible in this photo. It looks like this photo could have been taken on the same day as the one above. The upper photo was probably taken from the roof of the company store while the lower one was taken standing on the hopper. 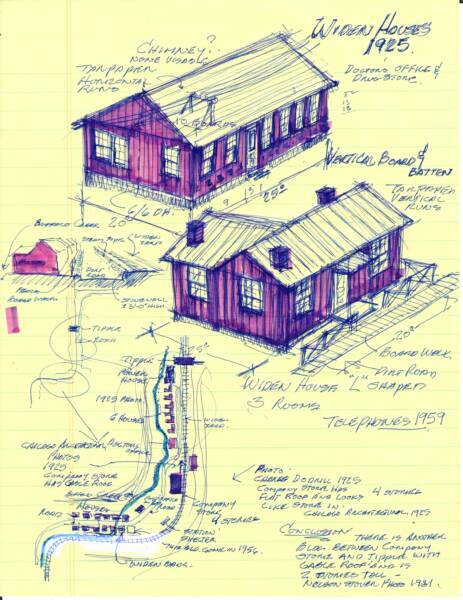 These photos were found on the internet at the Sigman site (see Internet References). On the posting it was suggested that it was taken in 1925 which seems reasonable. In the background is a very early tipple (1). This tipple was expanded and became much larger over the years. The power plant is to the left (2). Click on the photo and you can confirm that the hopper that appears new (4) is, in fact, a BC&G hopper! Now an important point of speculation. In an 1930's interview presented in Widen, An Appalachian Empire, Book 1, pg 19, it is stated that "the 'old' tipple was built near the site of the present company store". The company store at that time was located behind the photograher of this picture. It is also stated in the interview that the 'old' tipple was destroyed by fire. Theodore Griffith and others familiar with Widen dispute this statement and believe that the tipple at Widen was always at the same site even though it changed configuration over the years. WIden was named for Mr. L.G. Widen who supervised the grading of the final miles of the BC&G right-of-way. It is said that when the post office authorities asked for a name for the new town there were several suggestions, among them Rich Run. The post office wanted a name with only one word. Mr. Bradley suggested using the name Widen. Mr. Widen protested, saying he did not want his name tacked to such a wild place. Years later Mr. Widen returned to his namesake town he was happy with the quality of the town that Bradley had created. (Widen, An Appalachian Empire, Bk 1, pg 19). Phil Bonzon prepared these sketches of the houses in Widen in the 1925 era from available photos. 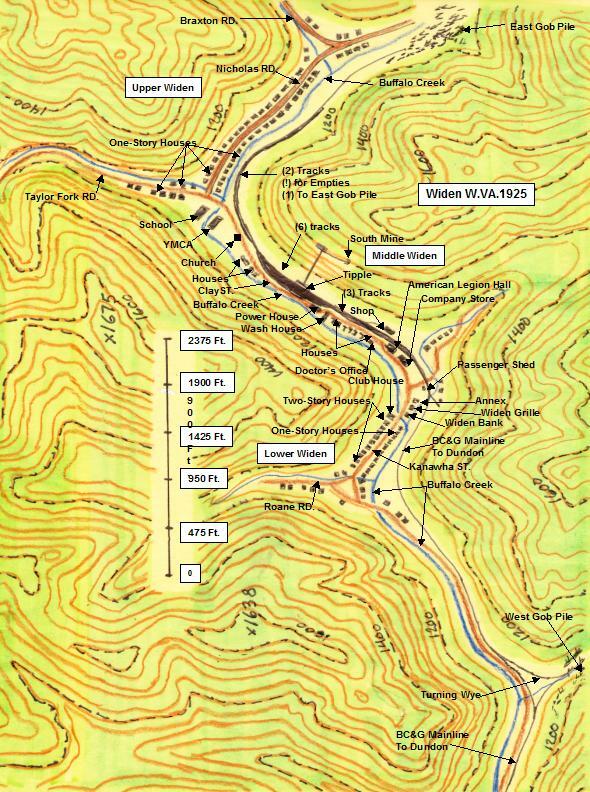 Phil Bonzon has compiled information from photos and other sources and created these detailed maps of Widen, probably the most complete such maps ever done. The maps are drawn over US Geological Survey topological maps so the relation of the structures to the landforms can be seen. The first map shows Widen 1925 and the second in the 1950s. 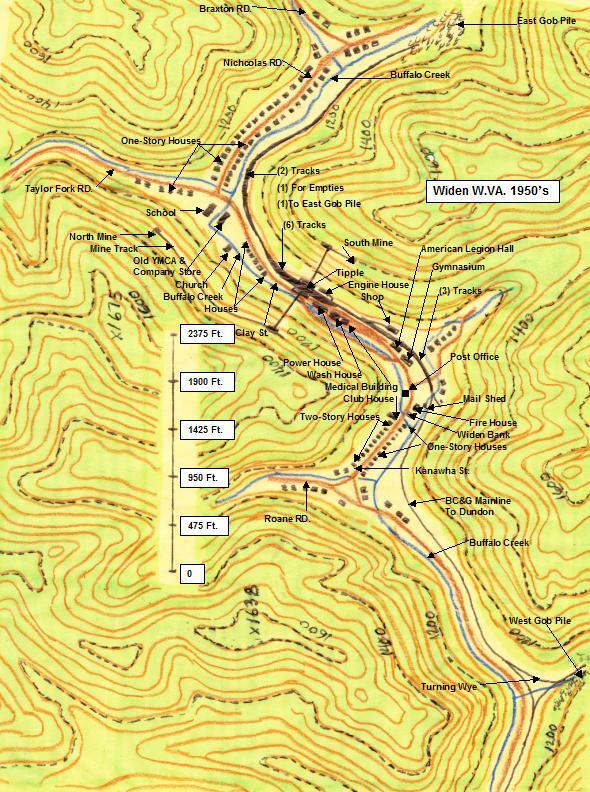 To see detailed maps of the track and structures around the tipple and middle Widen, CLICK HERE. Compare these photos to the 1925 map below. The names of the people in these four photos are unknown, but the images give a glimpse into the lives of the teens, children, men and women of Widen in the 50s and 60s. 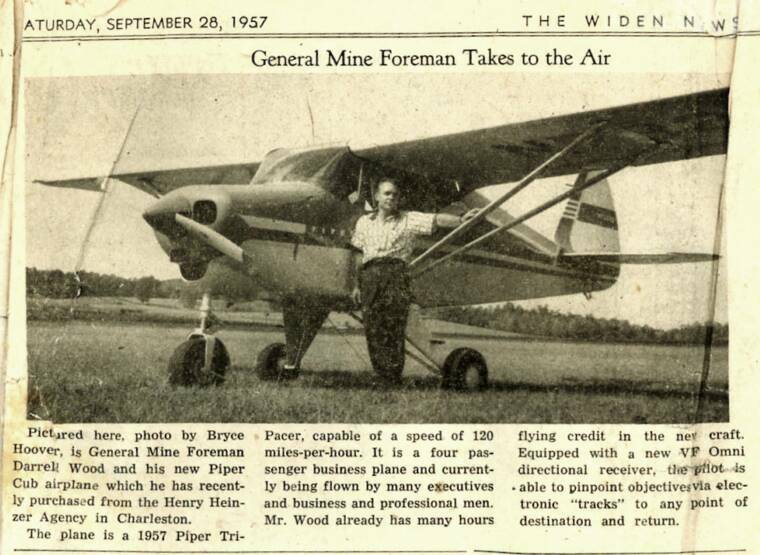 This fascinating clipping from the September 28, 1957 WIDEN NEWS shows General Mine Foreman Darrell Wood with his (apparently) brand new 1957 Piper Tri-Pacer. Boy, the ERC&L must have paid well! The clipping was provided by Naomi Ashley. According to Theodore Griffith, there was a small landing strip on the gob pile on the north side of Widen on which planes of this size could land. So where would Darrell land his plane? Well, Theodore Griffith provided these two photos of the small landing strip that was located on the top of the smaller gob pile that was located on the north side of Widen in the later years. The landing strip wasn't much more that a flattened spot on the gob. Notice the small windsock (yellow arrow), the only indication this is really an airfield! The landing strip wasn't much more that a flattened spot on the gob. Notice the small windsock (yellow arrow), the only indication this is really an airfield! In both views it almost looks like it wasn't even straight! Two photos by Theodore Griffith. After the sale, Pittston kept all the ERC&L employees of the mines, railroad and tipple and deep mining operations continued as before until December of 1963. Pittston brought in many of their own engineers, foremen, and electricians. They also brought in above-ground miners and began strip mining right along with deep mining. The tipple continued to wash and separate coal. The gob, however, was hauled by truck to the upper gob pile. The lower gob pile was abandoned. The BC&G continued to haul the processed coal out of Widen. Pittston was originally going to work until the beginning of 1964 but the tipple broke down in December and Pittston decided to cease all mining operatations then. When the mines closed in December 1963, Pittston ceased all operations in Widen and the remainder of all company facilities were closed. 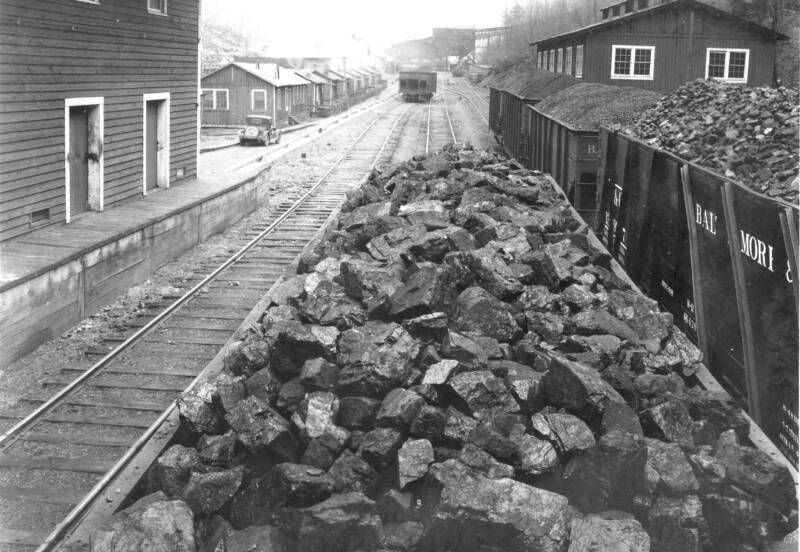 For a period of about six months after the mine closed, Pittston kept a handfull of ERC&L miners who worked taking up track, pulling pillars in the mines, dismantling the substation generators and head house machinery and loading much of that on trucks. Some of the underground equipment, cutting machines, loaders, motors, mine cars and track were hauled away and sold for scrap. Most of it was obsolete anyway. What wasn't sold for scrap was shoved into the abandoned shafts mines and sealed up. 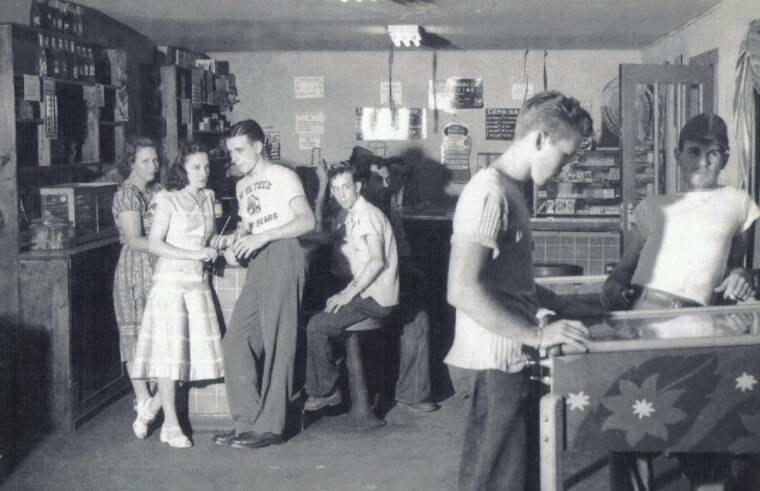 The employees weren't forced to move out of their homes, but for the majority of them there was no work left in WIden so they moved out of necessity. 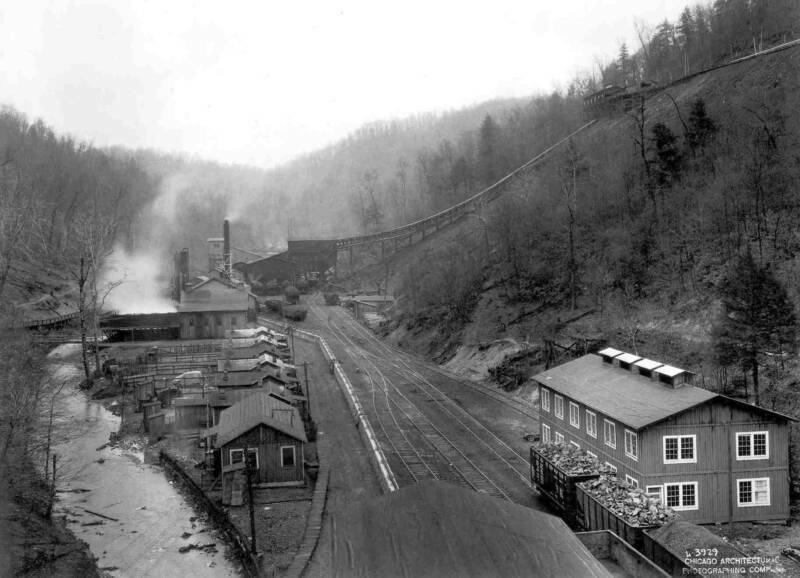 Some moved to near-by communities and towns and continued to work in the mines in neighboring Nicholas, Braxton and Webster counties. A large contingency of workers abandoned coal mining altogether and moved to Ohio and Virginia where they found better working and living conditions. 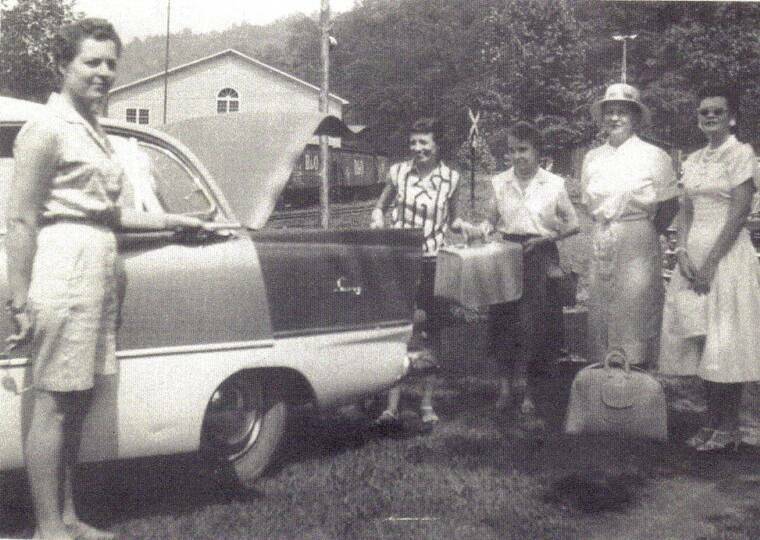 A few Widenites were able to retire and lease their homes in Widen for as little as $1.00 per month. Probably ten or fifteen years ago, owners were given the chance to purchase their homes and lot or lots from whoever happened to be in control of the former ERC&L property." Theodore Griffith has provided these exceptional, and rare, views of the area of Widen behind the tipple, the so-called 'back track'. The tipple is behind the photographer in these pictures. The YMCA is marked "A" and the High School / Elementary Scholl complex is across the Buffalo Creek and marked "B". There were two tracks running parallel in this area. One served as the track to the upper gob pile while it was in use. The other was where empty hoppers were stored in preparation for loading at the tipple. When the upper gob pile closed, the gob track became the storage track due to its longer length. Theodore took these pictures on the same day and counted between 60 and 70 hoppers on the visible sections of track. Phil Bonzon made use of these photos, plus others, when creating the maps above.